Is your pool builder accredited with the BBB, Angies List, etc.? Here at Daigle Pools we are A+ accredited with the BBB and A accredited with Angie’s List. Does your builder deal direct via cell phone to cell phone? Our philosophy here at Daigle is Service First. All In-Ground clients deal directly via cell phone with their sales person who is also their project manager/ foreman. Is your builder available to you 7 days a week? With Daigle your sales person / foreman is available 7 days a week from 7:30 a.m. to 9:00 p.m.
Is your builder fully insured? We carry 1M/ 2M coverage and supply our customers with a certificate of proof of insurance. Does your builder have a full disclosure of what’s included and what can come up with ground conditions? When you sign on with Daigle, we have a full disclosure page stating all possibilities with what could be under ground. We can’t see it until we expose it. However, we will give as much information as possible for you to make an informed decision. Is your deposit fully refundable with your builder? We all work here at Daigle Pools. 7 days a week from April through the 4th of July. When the unexpected occurs, we understand. Call your sales person/ foreman he will take care of everything. Do you know what’s under your liner? 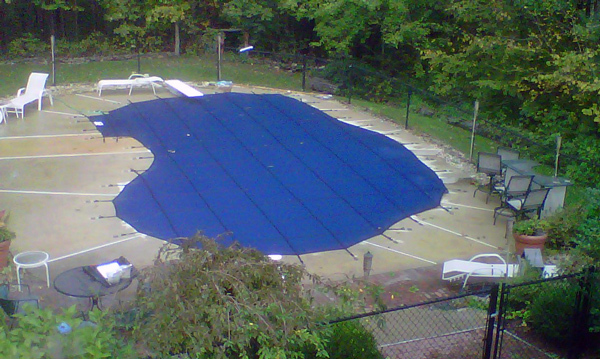 There are still companies using sand or even stone dust under pool liners. Here at Daigle we strictly use pool base which is a Portland cement/ vermiculite mix. It hardens like cement but is porous and breathable for our wet springs. Do you have a solid time line for the start to finish of your pool? We tell all our customers, it’s a 3 week project weather permitting. We haven’t had a job go over 2 weeks and 3 days in about 5 years. Our quickest install was in October 2014. It took 8 days from start to finish! 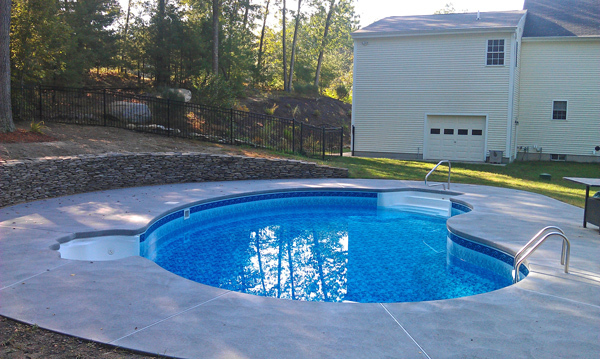 Do you know what warranties come with your new pool? We will explain to you all warranties for structure, liner, labor, filter, pump, safety cover, salt system, etc. Remember all our liners come standard with a 5 year 100% replacement on manufacturer defects including labor and water. Does your builder have a service department? We started as a service company and truly believe if you service your customers and build relationships, they will always call us for service and refer us to their friends and family. With two full time service crews, we are happy to assist in any way possible. Pool School! We’ll have one of our experienced service technicians come out for Pool School 101 upon completion of your new in-ground pool to make sure you have the knowledge to enjoy your pool for years. As you can see there is a lot to know about pools. Hopefully this information helps you ask the right questions to make sure you find the pool contractor that will work best for you!